Another year of stunning growth, helped by a balance of fair and wet weather. 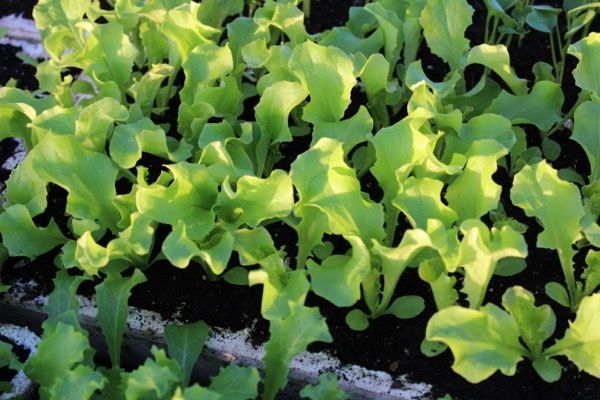 The current sunshine shows the importance of light for healthy growth. 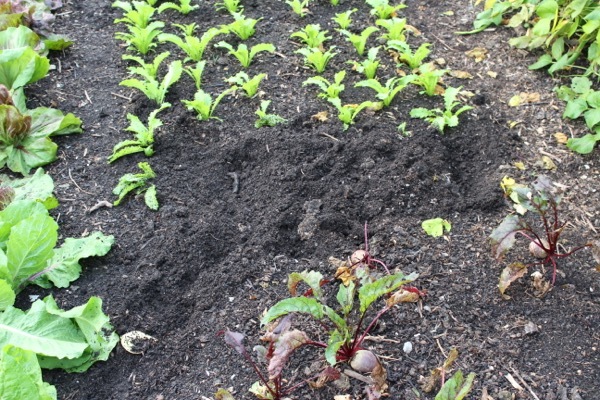 Also the recent dry weather has been good for hoeing weeds, although in my undug garden there have been very few germinating since April: one of the many virtues of surface composting as the only soil preparation. and only a few beds have wooden sides. 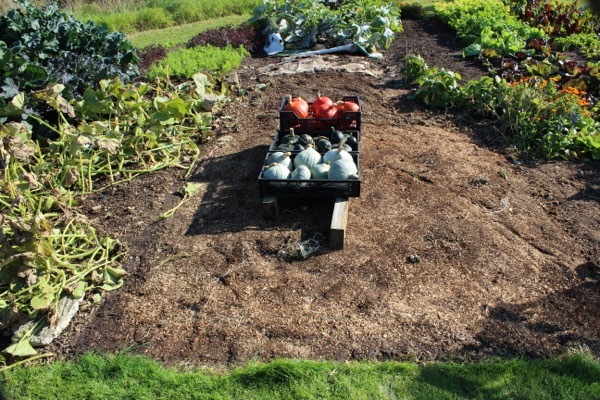 From now until year’s end you can mulch beds, after any final harvests. 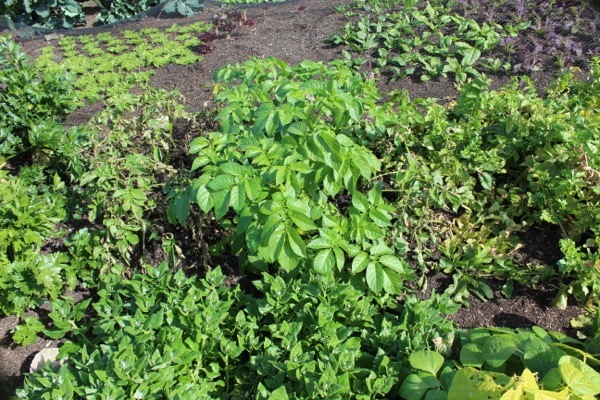 For most vegetables and in damp climates I recommend you use well finished compost, though it may not be perfect. I use a manure fork to break up lumps into small pieces before spreading, then find that winter weather continues to make the compost more crumbly and softer by spring. 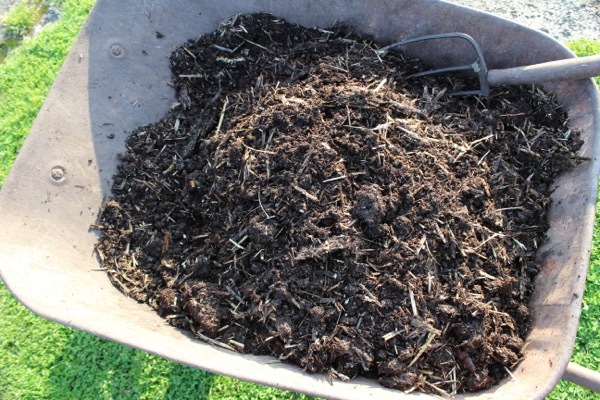 Here a lot of the compost I spread is animal manure, at least a year old. 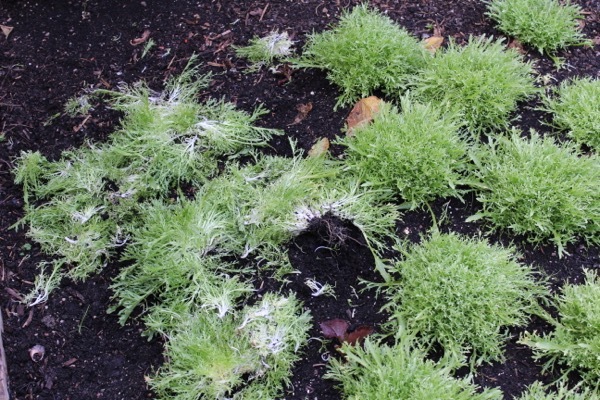 Before mulching I clear all weeds as I am spreading no more than 5cm (2in), sometimes less. 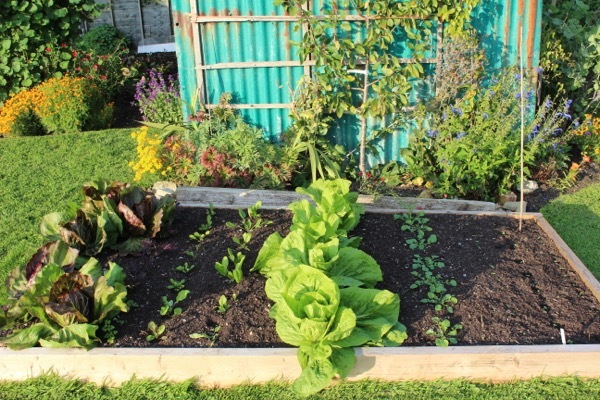 Or if clearing weedy areas, use a polythene cover as in the photo below where I had spread horse manure with wood shavings last Christmas, over weedy pasture with couch grass and bindweed. Then we planted squash through holes I cut in the polythene in May. All weeds have perished except the bindweed, and its a good harvest. 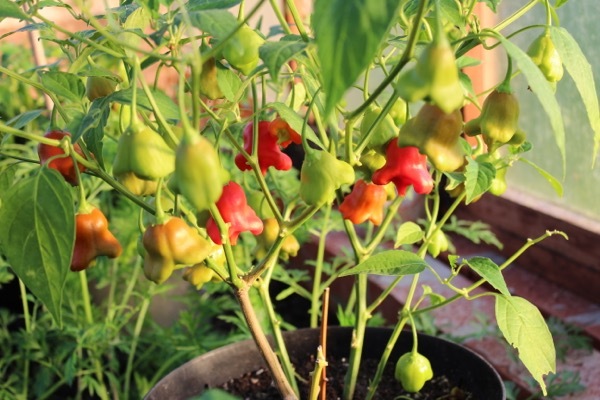 You can keep chillies alive in a light, frost free place. I have some in pots which I move into the conservatory in winter, with many chillies on, then I cut them back hard after the last harvest. 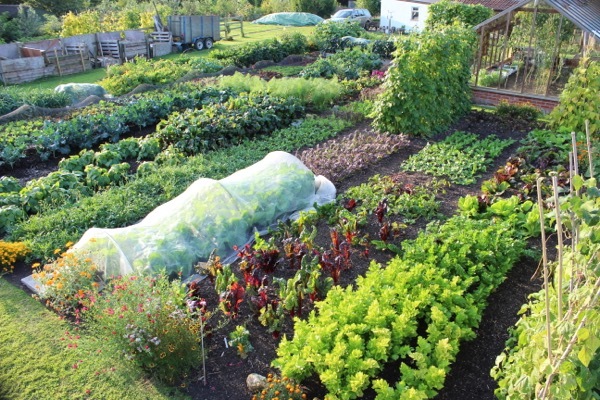 A year of steady harvests from both dug and undug beds has seen each bed give nearly 70kg of vegetables already. 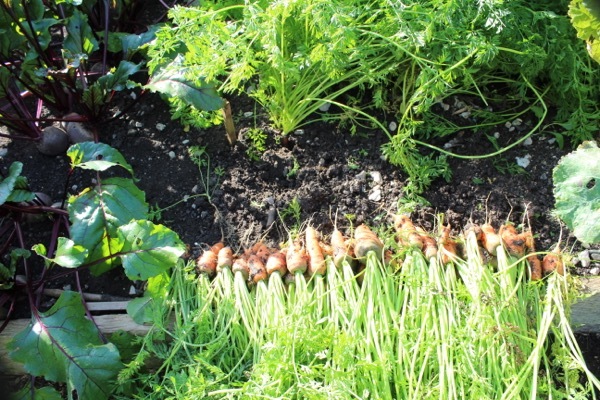 Harvests between the two are mostly similar but recently I was amazed to see so much difference between carrots, with the undug bed’s roots much cleaner and bigger. 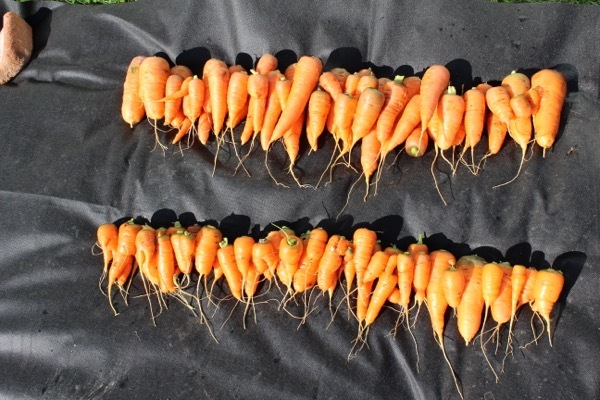 other carrot harvests have shown smaller differences. Meal times now offer so many choices of vegetables to eat. Also some current harvests are to store, for example I pick Czar, Borlotti beans every week as the pods yellow. 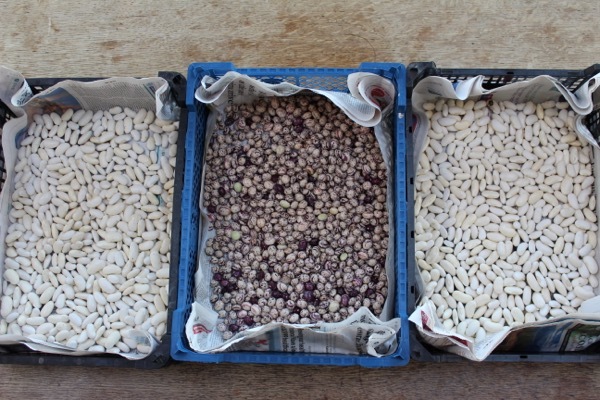 Then after shelling out the beans, I lay them in trays on a sunny window. 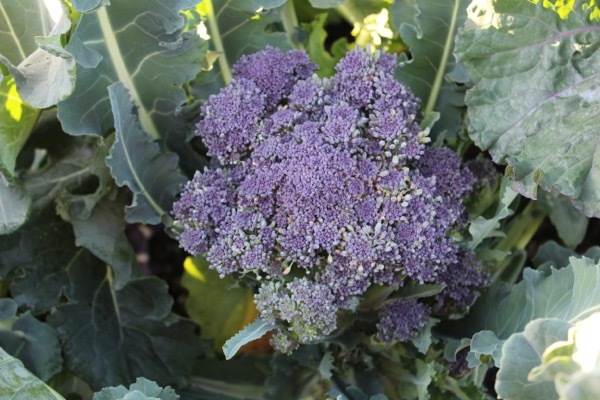 Many great harvests such as Florence fennel, celery and broccoli will finish at the first frost but that looks a way off. 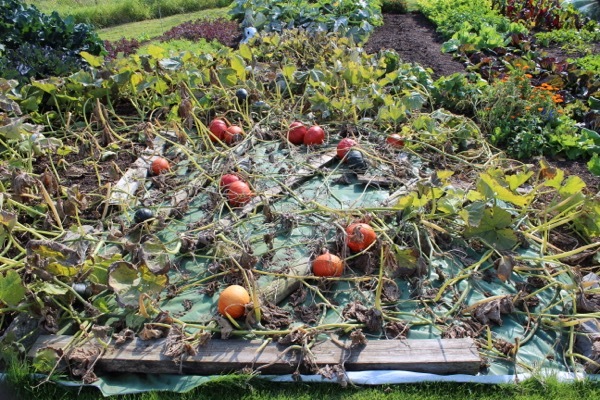 So winter squash can stay outside if their skinns are still soft For how I planted the potatoes see this link. Flavour comparison – both good!and texture is creamy, shame there are so few Gemson! 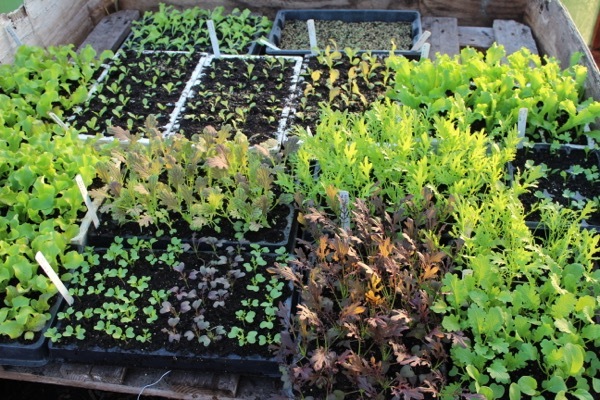 For winter salads its now about planting under any kind of cover, whatever you sowed in September. 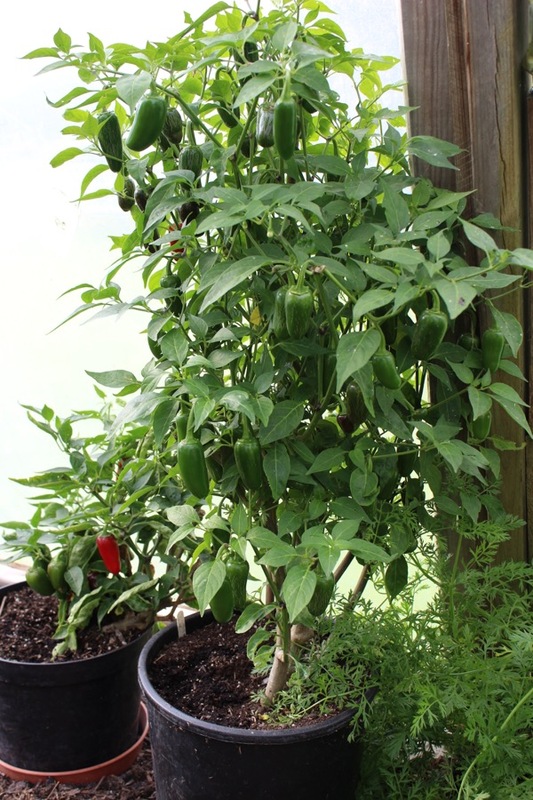 My plants are a little too forward as I was not expecting this warmth, and tomatoes are still ripening where I want to plant them. You can propagate tomatoes from side-shoots, I have a three year old Rosada plant. 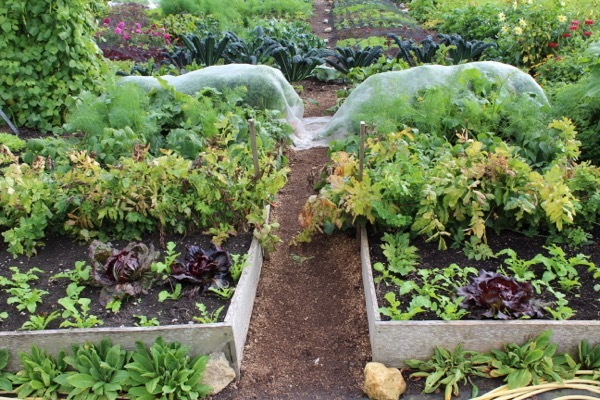 Simply put a small side-shoot into moist compost in October, keep it light and frost free. Side-shoots of tomato put into horse manure in August, to see! Outdoor planting in October is limited to garlic and onion sets, although I am trying November garlic-planting as I noticed that it resulted in less rust last year, see also . 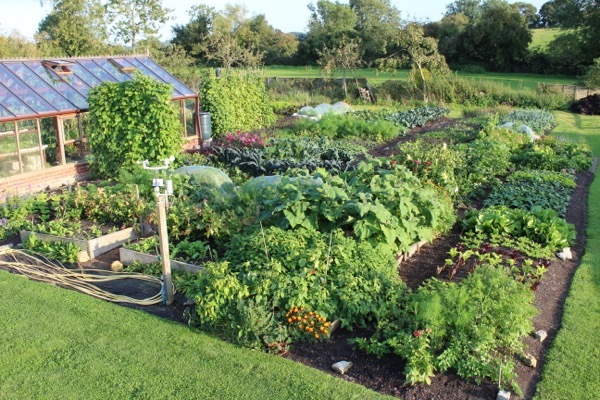 Except for northern regions, wait until November before sowing broad beans, otherwise they grow a bit tall before winter and then succumb to wind and frost. 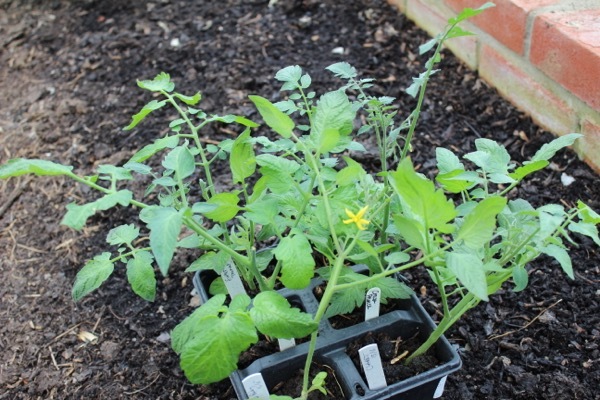 The tomatoes in these photos have had no water for three weeks, though clearly there is moisture in the soil. Being dry encourages ripening. 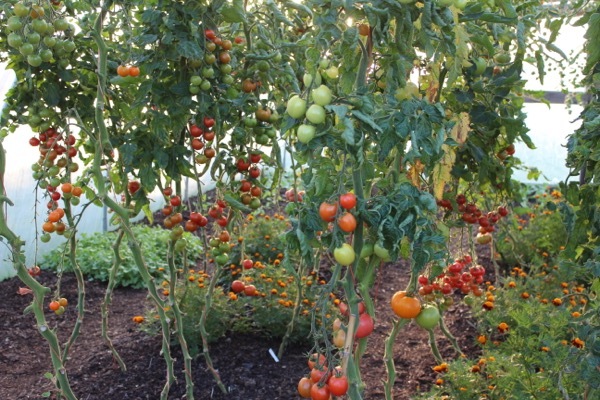 My greenhouse tomatoes have almost finished ripening all their fruits, it is warmer than in the polytunnel where there will be a few green tomatoes when I remove plants in mid October. 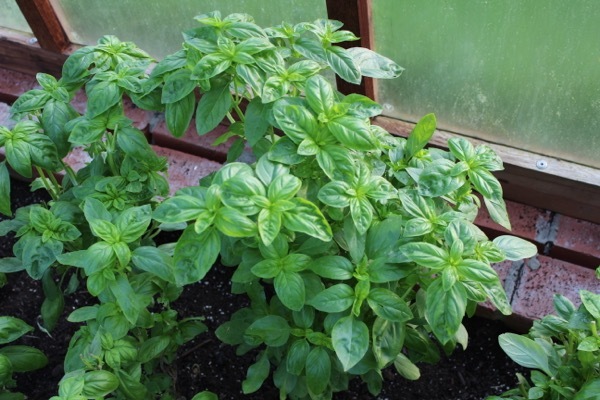 Basil likes dry warmth and this summer it has often been a little cooler than it prefers. 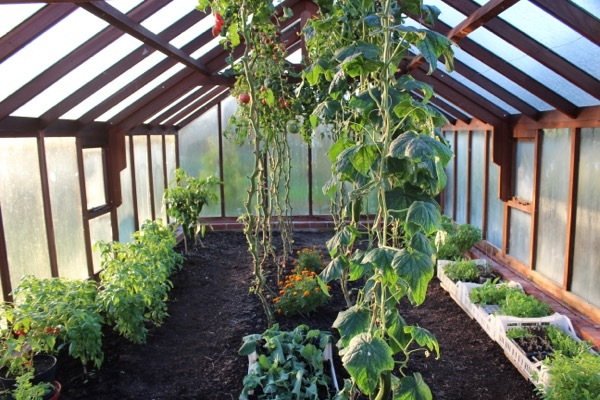 As with tomatoes, it has been better in the greenhouse where harvests may continue for another fortnight. Everyone has different ones… on the forum we heard about cockchafer grubs (thanks Pete Budd), which eat some plantings at the stem. Here I suffer occasional damage from badgers, and my neighbour had a whole bed of kale dug up, so he is well demoralised. He has tried fencing and feeding but to no avail, they are powerful animals. 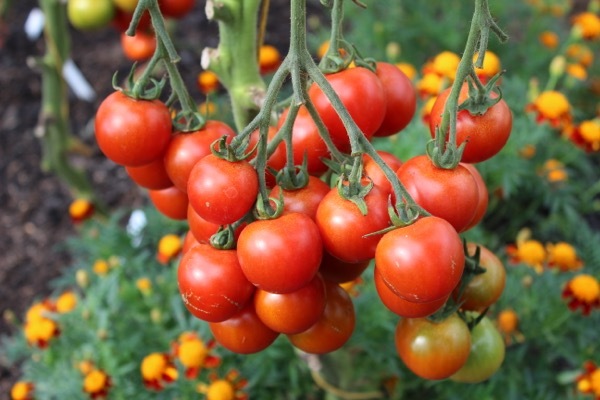 In order to succeed in transplanting tomato shoots, does the shoot need to be a genuine ‘sucker’, or will the plant regenerate from any stem with leaves on? I have an F1 strain which has produced very fine late tomatoes, but I’ve already plucked out all the large suckers long ago. There is one fairly small one which has grown out in September, so it’s either that or a stem which is not a growing tip…..
Grow from seeds again next year if not, I guess…..
Normal shoot works fine, two inches long is ideal, not too big. 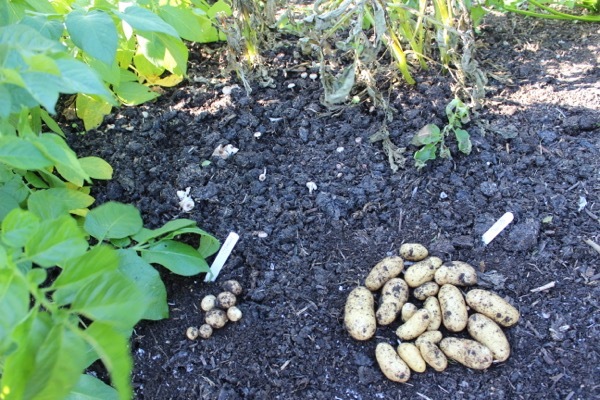 Unlucky for most of your Christmas potatoes getting blight, hope the Nicola survive. 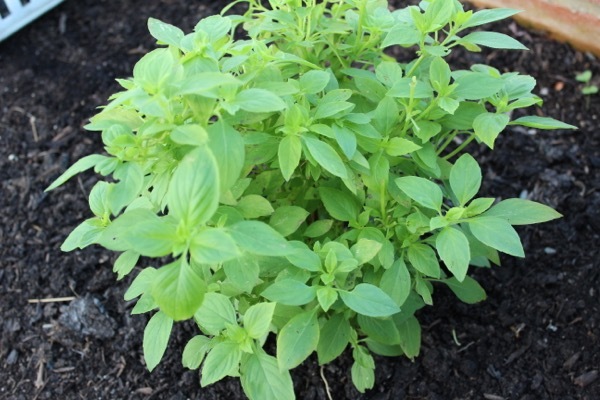 Did you plant any in pots or undercover as bankers? 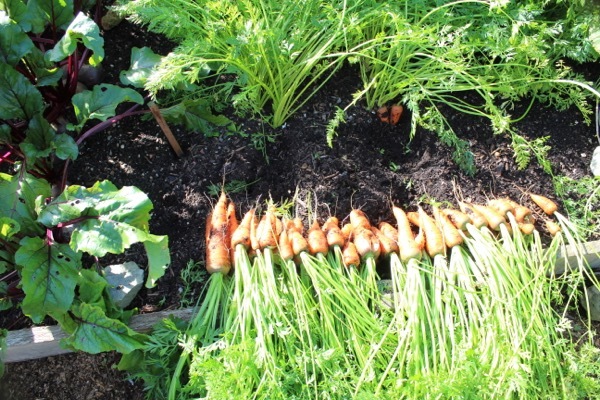 Super Carrot harvest, just shows, why waste time digging when you can get equal or better harvests by the no dig way of putting compost on and keeping down the weeds? Looks like predictive text got the upper hand on the pic of the Autumn Sprouting Broccoli, (seditious?) I can’t work out what it is meant to be. Sorry that is autospell on side-shoot. The potatoes were just to see, I have a good store of Charlotte from July and actually find they taste as good as “new” ones in autumn! 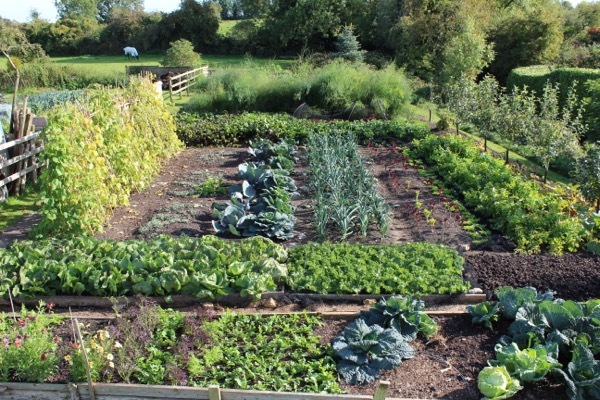 Yes I wonder why more gardens do not try no dig for all veg really, I have so much to harvest here. Good luck with your picking, sowing, planning. Yes I give no dates but it sells fast, keep it simple and happy harvesting, selling, crops will be light until March.